In a drastic change in opponents than what the Mastodons saw in No. 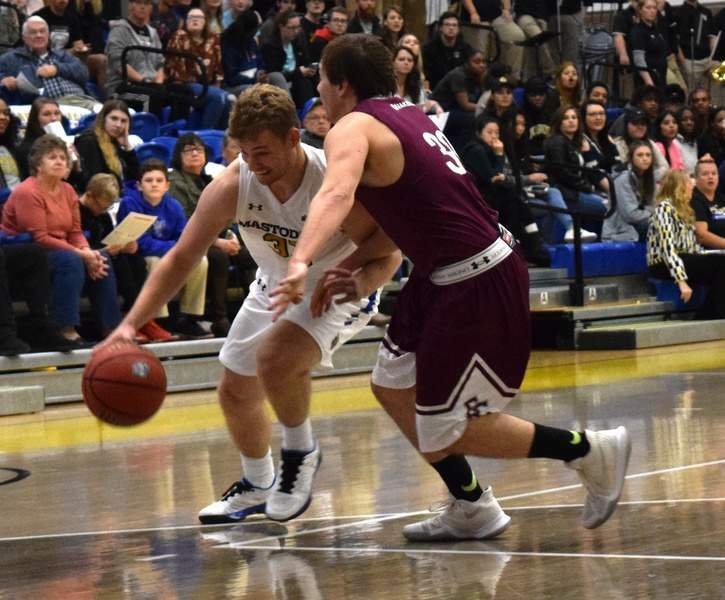 21 UCLA in the season-opener Tuesday, Purdue Fort Wayne got to the rim with ease and never pumped the breaks on Earlham, beating the in-state opponent 112-51 at the Gates Sports Center on Thursday. It was the second-most points scored by Purdue Fort Wayne in the Division I era. Coach Jon Coffman, in his fifth season at the helm, extended his home-opening winning-streak to five. The game counted for the Mastodons (1-1) and was an exhibition for the Quakers. Despite scoring the first two points of the game, the Quakers had no answers for the more physical and bigger Mastodons. The Mastodons led 46-22 at the half, which ballooned to 77-40 at the midway point through the second half. Coffman's team saw a balanced offensive effort, scoring 52 points in the paint, 38 off turnovers and 31 fast break points. The bench contributed 61 points. The Mastodons also out rebounded the Quakers 49 to 26. Freshmen guard Jarred Godfrey led all scorers with 23 and Qawi Rucker scored nine to lead the way for Earlham. Redshirt senior John Konchar scored 17 points for the Mastodons, all in the first half. Earlham freshmen Anthony Phillips had a homecoming of sorts, the Fort Wayne native is a Wayne graduate. He played 14 minutes and notched two rebounds and two assists. Purdue Fort Wayne has little time to regroup as the Mastodons head to Columbus for a game with Ohio State on Sunday afternoon.